A quick drive from downtown Bend, Oregon, Tumalo Falls is one of the most popular waterfalls to visit in Central Oregon. 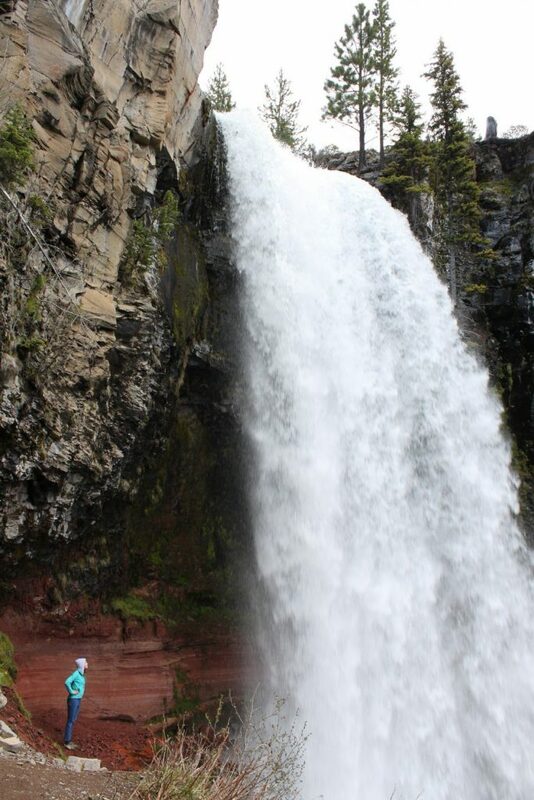 This easy hike first rewards you with the magnificent Tumalo Falls and offers much more up the trail. You’ll pass a total of seven cascading waterfalls along the North Fork trail as you head up towards the Cascade Mountains. The nearly 100-foot falls pour over the edge of ancient lava rock, plunging into Tumalo Creek below where it continues to wind peacefully through young pondersa pine forest. The falls are the tallest around Bend and are a perfect way to spend the afternoon—whether you are just looking for a photo op, picnic, hiking, mountain biking, or just taking in some of the beautiful Central Oregon outdoors. At 97-feet (30 m) Tumalo falls is the tallest and one of the most spectacular waterfalls in the Central Oregon area. The falls are on the snow-melt fed Tumalo Creek, which is begins high above in the Cascade Range west of Bend. There are several smaller waterfalls upstream along Tumalo Creek. The falls are within the Deschutes National Forest and on the drive approaching the falls you will be quick to notice the remnants of the 1979 Bridge Creek Fire. There are many pull-outs along the gravel section of the road where you can find ideal picnicking or fishing spots. 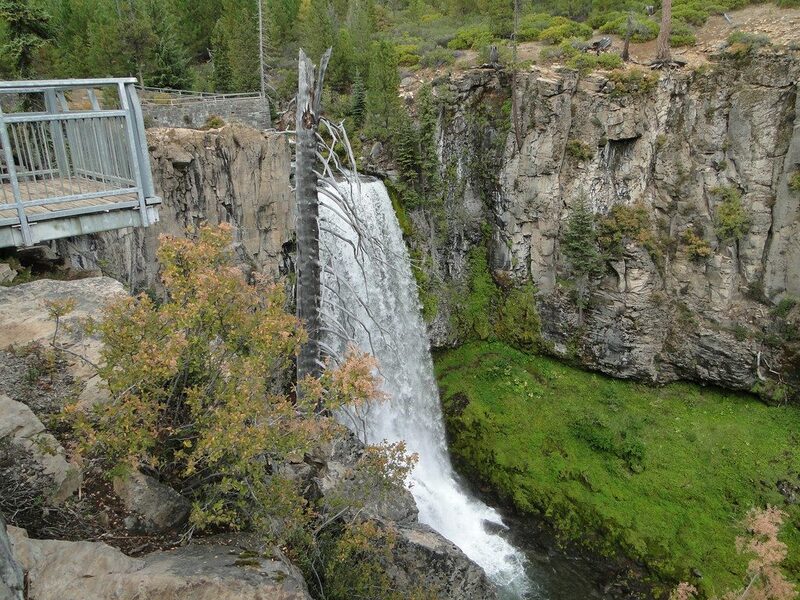 If you’re visiting Bend, Oregon, taking the journey up to do the Tumalo Falls hike is a must. It’s easy to reach from town and is one of the most stunning waterfalls in the area. Plus, you can easily venture farther up Tumalo Creek on longer adventures. Hiking to Tumalo Falls is easy and straightforward. From the trailhead you head uphill on the North Fork Trail, which will wind its way through tall Manzanita and young Ponderosa pine that are a relic of the 1979 Bridge Creek Fire. After a few switchbacks you will reach the spectacular Tumalo Falls overlook platform just 0.25 miles from the trailhead. The trail is steep and loose, but well-maintained. Flip flops are not recommended—your best bet is to where running or hiking shoes. For those who want to venture farther, you can continue on the North Fork trail which follows Tumalo Creek and brings you to eight smaller waterfalls that are worth checking out. Even further (3.9 miles) you will reach Happy Valley where Tumalo Creek meanders through a lush grassy meadow. On your return, it’s possible to make a loop by returning via Bridge Creek by turning right at the Swampy Lakes Trail intersection or continuing back down the way you came. Note: The North Fork trail is uphill only for mountain bikes, but hikers can travel in both directions. 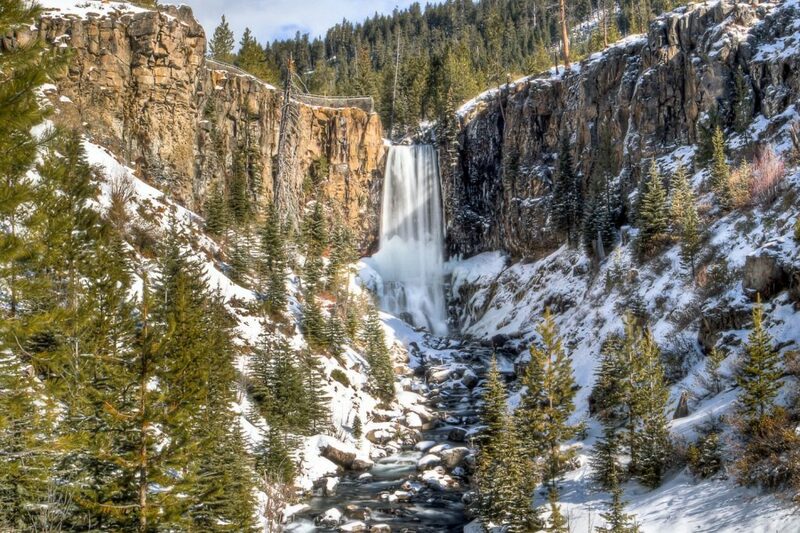 To reach Tumalo Falls from Bend, Oregon you can drive 11.6 miles Skyliner’s Road, after crossing the small one-lane bridge across the creek you will then continue 2.6 miles on Forest Road 4603, which is unpaved and can be fairly rough and wash-boarded. That said, any type of vehicle can make the trip—from Priuses to SUVs. At the end of the road you will reach the Tumalo Falls day use area and trailhead to the falls. Parking at the day use area requires a Northwest Forest Pass or fee payment from May 1 – September 30 and are available at this site ($5) or can be purchased from Forest Service offices or various vendors in Bend. However the fee area begins just before crossing the bridge and it’s possible to park (safely!) along the road side if you are lucky to find a spot.